We continue the reviews of Streamline Pictures’ releases. 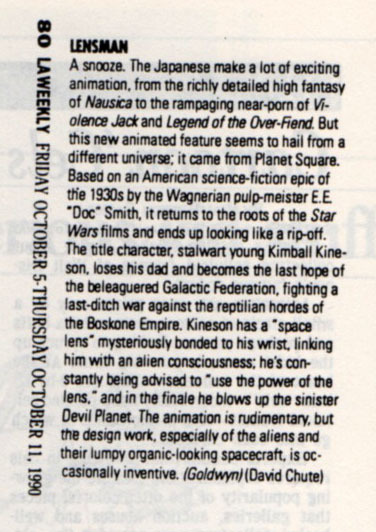 These are being posted for the record, but we also feel they will be of interest to animation historians as they represent some of the earliest serious commentary about anime published back in the 1990s. unsigned, Laser Picks, February 1994, pg. ? [Capers] “These stylish, timeless and immensely entertaining stories are the epitome of animated wit and sophistication. Adding substance to the over-all success of this collection is the work of accomplished anime director Hayao Miyazaki, recognized as one of the most talented animation artists in the world. 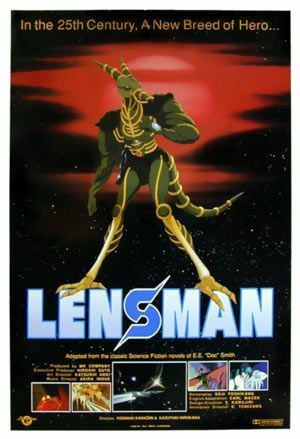 “Lensman” was recognized by most reviewers as being ostensibly based on E. E. “Doc” Smith’s classic s-f series of the 1930s & ‘40s, but actually licensed from Berkley Books (which had reprinted the books in the 1960s in paperback and had the rights) to enable the producers to make a “Star Wars” rip-off without legal danger. 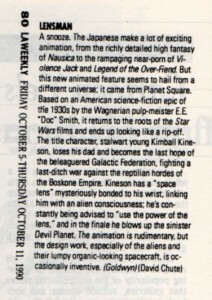 Doc Smith (a veteran Worldcon attendee dressed as Kimball Kinnison, even though he was decades too old for the part) was long dead by then, but his daughter Verna put on a fire-breathing campaign denouncing the movie as being what it was: a “Star Wars” imitation and not the “Lensman” saga at all. I always felt that she missed a great opportunity to promote the movie as great fun, and if you like it, be sure to read Doc Smith’s novels to see what you’re missing; and to get the out-of-print paperbacks reissued. But Verna Smith railed against the Japanese producers and didn’t pay any attention to Streamline Pictures. “Lily-C.A.T.” was also an obvious imitation, of the movie “Alien”. I liked it, and felt that it was unfairly ignored by the anime fans. 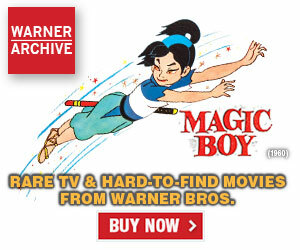 Streamline intended to license more than just the two Miyazaki episodes of “Lupin III”. The TV series lasted three years and 155 half-hour episodes. But when we tried to license a third, TMS said (paraphrasing): “Wait a minute! There are 155 episodes in that series. We want to sell the whole series to the Americans, not let you cherry-pick the best episodes and leave us the rest.” Streamline couldn’t afford the whole 155, so we gave up at that point. 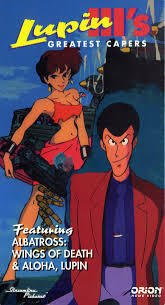 We used Mark Merlino’s unofficial title of “The Mystery of Mamo” for the first “Lupin III” theatrical movie. 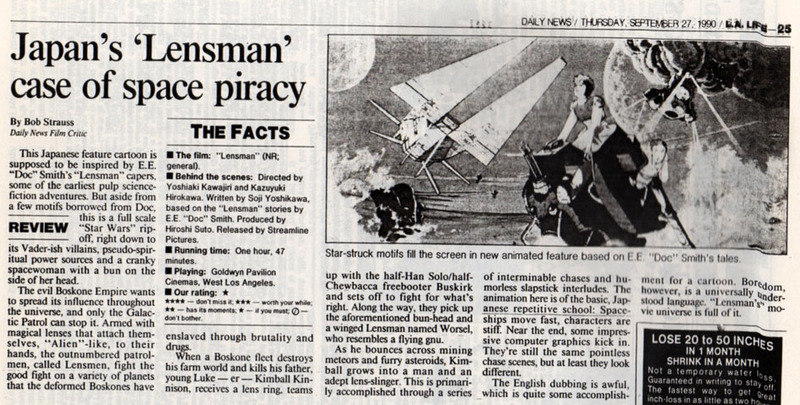 It was already well-known in anime fandom by that title; we liked it better (more alliterative) than TMS’ recommended “The Secret of Mamo” (or Mamoux, according to TMS’ script); and both Streamline and all the fans felt that “Lupin versus the Clone” gave away the mystery. I see that when Streamline’s license expired, TMS re-sold it as “The Secret of Mamo”. Streamline’s “Lupin III: The Mystery of Mamo” video cover was an original watercolor painting of Lupin and Fujiko that Monkey Punch had painted for the Nippon Columbia l.p. album cover of the jazz movie music by Yuji Ono. I had bought it from Monkey Punch; and I provided it from my large s-f/anime/furry art collection. Well I’m glad she didn’t go after you guys with this. 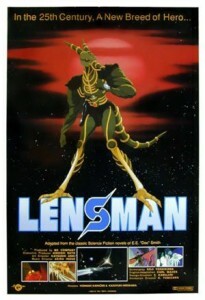 I would say I enjoyed every minute of Lensman myself despite not having read the books at all. I call it a “no-brainer” film personally. It didn’t have to do anything than what it promised to deliver. Glad I still have it on laserdisc! I’m sure TMS had it’s reasons. Even if it did take longer for anymore episodes to come our way. Persistent, aren’t they? It’s there way or the high way! Excellent choice for the cover. 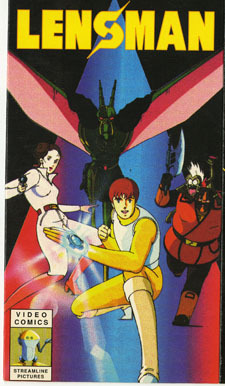 Discotek’s cover isn’t that bad either. When I began reading s-f in depth in my teens in the 1950s, I kept seeing references to E. E. “Doc” Smith’s classic Lensman novels: “Triplanetary” (1934), “First Lensman”, “Galactic Patrol”, “Gray Lensman”, “Second Stage Lensman”, and “Children of the Lens” (1947-48). But they weren’t available! The original s-f magazines of the 1930s & ‘40s were long-gone, and they were only reprinted in attractive hardcovers from a tiny s-f specialty publisher, Fantasy Press, that the Los Angeles Public Library ignored. It wasn’t until I went to UCLA (1959-1963) that I found copies to read. Pyramid Books (which was later absorbed by Berkley Books, which was how Berkley got the rights to sell an anime movie version) reprinted the whole series in paperback in 1965-’66, and they became generally available. Smith knew the paperbacks were coming, but he died in 1965 (75 years old), so he never saw them or the public’s reaction to them. “Doc” Smith would be the first to admit they were terribly dated by the 1960s, and strictly for adolescent lovers of space opera with heroic space policemen/secret agents and wars between galaxies. (S-f critics pointed out the similarity between the Lens and the Gestapo’s silver identity shields that gave them power over the German general public.) But they were, and still are, rousing good fun, and very popular in Japanese editions before the anime movie. Reportedly Randall Garrett wrote a parody, “Backstage Lensman”, that he read aloud at the 1949 Worldcon that had Smith rolling on the floor with laughter. Smith never outgrew his devotion to what adolescents wanted. It was too bad that his daughter lacked his sense of humor and put him and the Lensman series on a shrine. 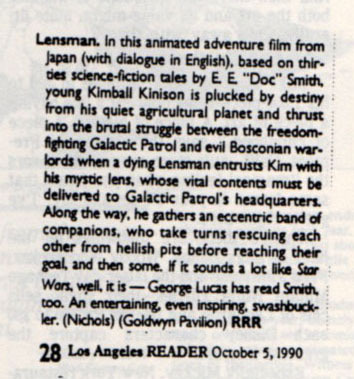 George Lucas admitted being a “Lensman” fan in his teens, which was a major reason that “Star Wars” was so derivative. Reportedly Ron Howard pitched a serious “Lensman” movie to Universal Pictures in 2008, but Universal felt that it would look too much like a “Star Wars” rip-off. I don’t know how available the books are today, but if you liked the Japanese movie, you’ll like Smith’s books better. If you can find them. 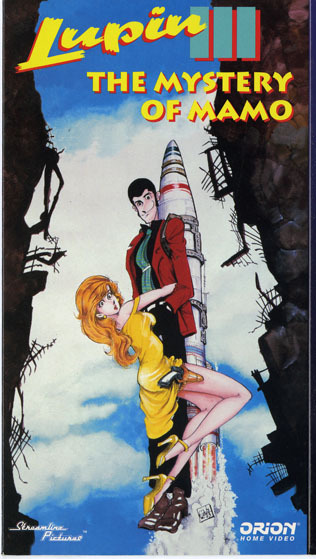 I always objected to the American fan translation of the title of the final episode (#155) of this “Lupin III” TV series as “Farewell, Lovely Lupin”. The Japanese title can be translated several ways, but what is meant is the close of a letter to a friend: “Farewell, with love; Lupin”. Carl Macek said that since it was well-known by all anime fans that this second TV series wasn’t Lupin’s final farewell — he reappeared in a third TV series a couple of years later — a better title would be “Aloha, Lupin”, since the Hawaiian “aloha” means both farewell and hello. That was a more fitting title I thought. I think those two episodes Streamline did are still up on Hulu as we speak. It was cool TMS or whoever provided those to them to use alongside the other 50 episodes or so Pioneer/Geneon did. 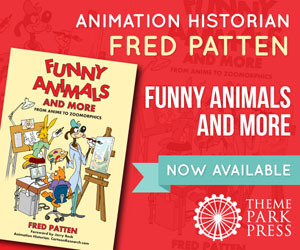 Fred Patten (1940-2018) was an internationally respected comics and animation historian. He has written about anime or comic books for publications ranging from Animation Magazine and Alter Ego to Starlog. He was a contributor to The Animated Movie Guide (2005), and is author of Watching Anime, Reading Manga (2004, Stone Bridge Press), a collection of his best essays, and Funny Animals and More (2014, Theme Park Press), based upon his early columns here on Cartoon Research. He passed away on November 12th, 2018.